This entry was posted in Professional and tagged charts, excel, Financial Literacy, Glow, graphs, Microsoft, Microsoft Office, Microsoft Office 365 for Education, numeracy, OneDrive, spreadsheet, Spreadsheets on 12 February, 2019 by Malcolm Wilson. The go-to presentation-creation tool for many teachers and pupils is PowerPoint. So as your pupils are already familiar with using Microsoft PowerPoint then consider using Microsoft PowerPoint Online available to all Glow users in Scottish schools as part of Microsoft Office 365. PowerPoint Online is available anytime, anywhere with online access so can be accessed at home or at school. You can upload an existing PowerPoint presentation from your computer or other device to your OneDrive in Office 365 in Glow (and then edit online from then onwards) or you can simply log into your OneDrive and create a new PowerPoint presentation completely online. You can choose to keep the presentation private to you in your own OneDrive (the online cloud storage with massive capacity available to every Glow user in Scottish schools). Or you can, at any time, choose to make a PowerPoint Online presentation visible to other users of your choice – and you can choose whether to allow them to just be able to view it or show it without being able to make changes, or you can give other users the access rights to be able to jointly edit the presentation with you, either at exactly the same time as you or at different times to suit each user. Have a look at the Sway presentation here for a step-by-step guide for learners to create a PowerPoint presentation in PowerPoint Online in their OneDrive in Microsoft office 365 via Glow and to share this with other Glow users to be able to jointly edit the same presentation. This entry was posted in Professional and tagged Digital literacy, Glow, ICT, literacy, Microsoft Office, Microsoft Office 365 for Education, Office 365, PowerPoint, Presentations, writing on 5 March, 2018 by Malcolm Wilson. So are your pupils are already familiar with using Microsoft Word? Then why not consider using Microsoft Word Online available to all Glow users in Scottish schools as part of Microsoft Office 365. Word Online is available anytime, anywhere with online access so can be accessed at home or at school. Word Online can be used to create document from the beginning (or you can upload an existing Word document from your computer to make it available to edit online thereafter). You can keep it private to you in your own OneDrive (the online cloud storage with massive capacity available to every Glow user in Scottish schools). Or you can, at any time, choose to make a Word Online document visible to other users of your choice – and you can choose whether to allow them to just be able to read it without being able to make changes, or you can give other users the access rights to be able to jointly edit the document with you. Have a look at the Sway presentation here for a step-by-step guide for learners to create a Word document in Word Online in their OneDrive in Microsoft office 365 via Glow and to share this with other Glow users to be able to jointly edit the same document. This entry was posted in Professional and tagged collaboration, Digital literacy, Glow, literacy, Microsoft Office 365 for Education, word, Word Online, writing on 5 March, 2018 by Malcolm Wilson. In a nutshell, it’s an online environment where a teacher can assign tasks, track who’s completed tasks with ease, or provide feedback to support learners, share in seconds OneNote pages to every individual pupil’s section which can only be seen by the teacher and that individual pupil, have peer-to-peer conversations for collaborative work between learners or for teachers to provide individualised support to learners through teacher-pupil discussions. It joins up features available in Office 365 for Education – the OneNote Class Notebook, messaging, calendar, feedback, groups and email especially for classrooms. It works via a browser, or computer or mobile app for smartphone or tablet. Click on this link for an interactive step-by-step guide to Microsoft Classroom, what it looks like, how it works and how a teacher might use it with their learners. This interactive guide takes you through the steps combining video, audio, screenshots as well as inviting you to click on the sections to see what happens and move to the next step to find out how Microsoft Classroom works for a teacher. The video below is to the first in a playlist created by Microsoft Education of a series of short videos showing how to get started with Microsoft Classroom and how to undertake a variety of tasks a teacher may wish to do with their class. Microsoft has an online support section for Microsoft Classroom – Getting Started with Microsoft Classroom – click on the links which best suit what you need for step by step guides. Miguel Guhlin has created a playlist of videos exploring different features of Microsoft Classroom and how different parts can be used in a classroom situation by a teacher with their class of learners. There’s videos showing the learner view, including on a tablet device, as well as examples showing how teachers might share different kinds of resources, how learners might complete tasks, and how a teacher might provide different forms of feedback. Scott Letts has created some tutorial video guides to using Microsoft Classroom, How to set up Microsoft Classroom and Creating an assignment in Microsoft Classroom. When setting up the app on a mobile device it will usually ask for the Office 365 for Education – that will be the full Glow email address. Schools which have already been using Microsoft OneNote and have existing OneNote Class Notebooks can associate Microsoft Classroom with existing Class Notebooks. To do this ensure you have the desktop version of OneNote installed on your computer, and have added the Class Notebook Add-in. Then to associate an existing Class Notebook with a Microsoft Classroom click on > Connections > Map Class Notebooks. Is there a feature you’d like to see in Microsoft Classroom? Microsoft Classroom has a user voice forum where users can feed back on features they’d like to see modified or added in future releases to better support the use of Microsoft Classroom by teachers and learners. Click on this link to see what others have requested and add your voice if there’s something which would make this even better for your classroom use. This entry was posted in Professional and tagged Assessment, Microsoft Classroom, Microsoft in Education, Microsoft Office, Microsoft Office 365 for Education, Teaching Tools on 20 September, 2016 by Malcolm Wilson. Yammer – so what is it and why use in school? Yammer is an online discussion/collaboration tool which provides schools with a secure online environment where all pupils in a class can ask questions of their peers, where they can seek answers and help each other, bounce ideas around and deepen their own understanding of what they are learning in class. It is available to all users of Office 365 for Education, meaning all Glow users, pupils and staff, have access to this tool. And it can be accessed by signing in online in a browser or using a mobile device app. Yammer provides an ideal tool through which learners can learn about the use of social media, in a protected environment, where the pupils can be guided to model behaviours for use in an online discussion tool, which will apply to any social media tool pupils may meet outwith their schooling. So if a teacher is looking to help pupils learn about safe sharing, and what not to share online, being supportive and respectful of views of others, and a place for pupils to engage in deepening their understanding through questioning and responding to others, then Yammer provides a great environment for a school. How do pupils and teachers get started using Yammer? Glow users simply sign into Glow then navigate to any part of Office 365, such as the tile for Office 365 (School Site) and then click on the 9-square waffle icon to navigate to the range of tools available in Office 365 – and choose the Yammer tile. The very first time a user clicks on the Yammer tile they will be invited to invite further users – don’t invite others but instead just close that window (click on the greyed-out cross at the top-right or click on the background page behind the invitation panel. You’re then in Yammer and can start browsing some of the Yammer groups open to all users. Or, if a pupil is ready to join the private class Yammer group set up by their teacher, then the first time the pupil simply searches for the class group name, clicks on the link and requests to join by clicking on the “join group” button – that sends a message to the teacher who accepts their pupils into the group. Alternatively, rather than go to Glow first, users can search with an online search engine for Yammer or go straight to https://www.yammer.com where they can then simply log in using their Glow/Office 365 email address and password. How do you set up a Yammer group just for pupils and teachers in a class? A class teacher can quickly set up a private class group in Yammer. Click on “+ Create a new group” and then give the group a name – include in the group name something which identifies the school as well as the class name. Choose “Private – Only approved members” and untick the box which gives the option to “List in Group Directory” – that way only pupils who know what to search for will be able to find a teacher’s Yammer class group, and only pupils who the teachers knows are members of their class will be granted access by the teacher. Setting up that way avoids the teachers having to add a list of usernames – they simply tell their class what to search for, and to click on the “join group” button when they find the group. A teacher can see the list of pupils waiting to be added to their class yammer group by going into the Yammer group and then clicking on “Members” at the right-hand side. This will show which users have requested access and are pending approval by the teacher. It would be recommended to have additional teacher colleagues added as joint administrators – beside their name on the list of members just click on the cog icon and select “Make admin” to elevate that teacher to be a joint administrator of that Yammer group. What can you do in a Yammer discussion? You can ask questions, respond to requests from others, add comments or create polls to garner views of others. Attachments can be added to any discussion post – so pupils can perhaps discuss or share comments about a resource. You can even use the “praise” button to acknowledge the input of other users. A Yammer group provides a place to share resources, and links to related sites elsewhere. How are schools using Yammer? What safeguards are in place for Yammer users in Glow? Yammer groups can be set up to be private (such as for a class of pupils so that the Yammer group can only be accessed by pupils in that class with their teachers). There are also Yammer groups open to users across Glow and educators within Glow nationally act as Moderators for Yammer users, welcoming new users, helping guide users to use appropriate language in a supportive way. Everything in Yammer is identifiable to the individual user. There is a simple “report a concern” option for all users (either use the question mark icon on a page or anywhere you see a “Report a concern” button) which will alert the national Glow administrators to concerns raised, and who will provide the support required to resolve any issues. There’s also a filter to ensure inappropriate language can’t accidentally be posted. And of course the educational-focussed environment shared between learners and educators means there is a visible supportive environment. Users can set email alerts either to all posts in a specific Yammer group, or to individual posts where alerts would be sent for replies or comments just to that post. Yammer has an app for mobile devices – search on the app store for your device. Then once downloaded simply log in with your Glow/Office 365 email address (that’s where your Glow username has @glow.sch.uk added to the end, after your Glow username). For many users the use of the app will be the most convenient way to access Yammer. Day One Guide for the Glow Yammer Network (accessed using Glow account – but also available as a document download from the public-access site Yammer Guide for Glow Users) – a very helpful guide of do things to do, and things to avoid, as well as guides to getting the most out of Yammer, specially in the early stages of getting used to using Yammer in a school. Yammer Guide for Glow Users – a Glow-specific help guide to getting started with the use of Glow. This includes guidance and suggestions for managing Yammer in an educational context. So how are you using Yammer in your school? This entry was posted in Professional and tagged citizenship, collaboration, Digital literacy, Discussion, E-Safety, Glow, Health and Wellbeing, Microsoft Office 365 for Education, Office 365, Social Media, Teaching Tools, Yammer on 5 May, 2016 by Malcolm Wilson. Microsoft in Education is a site which provides free on-demand personalised learning for teachers in exploring the use of digital technologies to support learning and teaching – learning at a pace which suits each teacher on the topics they find most useful to them, at the time they need it. The online hub provides a Training and Professional Development section which is divided into Quick Tip Videos, Courses (which can be filtered by age range of learners, tools, skills to be developed, etc), and Learning Paths which provide a more in-depth look at use of digital technologies compbing different methods of delivering the information and sharing of skills as well as exemplars. There is a wide range of free instant-access online courses. Some of these are short tool-specific how-to guides to learning the basics of getting started using specific digital technologies such as Sway, Skype, OneNote, Powerpoint, Minecraft, Office Mix or many other tools. Some are just short quick-tip videos highlighting a specific feature of a particular piece of software. Some courses are longer and look at how digital technologies can best be used to support learning and teaching in different contexts. These combine text guides, video explanations and examples, as well as quizzes to help understanding. And by signing up to the free Microsoft in Education Community a teacher can access a wider range of resources shared by other teachers around the globe, and when working through the range of courses on offer a teacher can gain visual recognition through digital badges of their accomplishments. Working through the online resources, with badges to record progress, can provide an extra degree of motivation when there is a tangible record of what skills have been acquired, and perhaps a spur to just complete another one (and another, and another!!). So whether starting out, or just looking for an illustration of a particular application in a classroom setting, reading about how others are using digital technologies to support learning, an online space to discuss with colleagues worldwide what’s worked (or look for advice when you might be looking for a solution to something which has not worked in your situation), or wanting to further explore how to integrate digital technology to best support learners in your school, there is something here for every teacher. This entry was posted in Professional and tagged Continuing professional development, CPD, CPL, Digital literacy, educator community, ICT, information literacy, Microsoft, Microsoft in Education, Microsoft Office, Microsoft Office 365 for Education, Teaching Tools, Technologies on 23 March, 2016 by Malcolm Wilson. Connecting classrooms via video link has been found by many teachers to add an extra dimension, an enthusiasm and real audience, to complement learning in a classroom setting. Whether that’s a face-to-face video call to another classroom in another part of the same local area (perhaps primary schools where pupils will work together in a similar geographical location, maybe connected by the same high school to which most pupils will attend), or to an acknowledged authority with specialist knowledge or skills who could inspire learners. Teachers using a live video link to connect classrooms can, to some, seem something quite ordinary and commonplace, and to others is still something which generates a worry about perceived technical complexities. Not so long ago most schools would have been unable to even consider a video call simply because of lack of suitable equipment, infrastructure or bandwidth. Now, where there is good bandwidth, there are often several options available to make video-conferencing possible with relative ease. Although the occasional use of video-conferencing may appear to be, in itself, a reason for using it as a skill to be learned, as with any digital technology it will only be of great value in the learning process if there are clear learning outcomes from the experience planned by the teacher. So a music teacher or instrumental tutor working from afar via video link with a learner elsewhere will have their focus on what is to be taught and what the pupil is to learn, rather than on the video link being seen as a one time gimmick. That applies whether the class members are asking questions of an author, or a museum collections specialist, or an engineer – it’s not the novelty of using a video-conferencing tool which has to be at the centre of planning, but what will be done in the video link conversation. What tools can I use to video-conference? There are a number of tools available to link via video, whether online conferencing tools, mobile device apps or installed software on desktop computers. Schools will generally often find that specific tools have been configured for their networks as video-conferencing involves access to network firewalls/ports. And this may be different in schools or for other users in another geographical location. Therefore it would always be good to check in advance of any planned activity what can work best in any particular situation. This post concentrates on two tools for video-conferencing which are available to all Scottish schools via Glow, though there will be other web tools, desktop applications or mobile device apps which could be used. Skype for Business, formerly called Lync, is part of Office 365 available to all Scottish schools. Note that for Scottish schools using Skype via Glow this is available between staff accounts only. If a school wishes to use their Glow account to connect with a body outwith Scottish schools they would require to have a partner Glow account set up for that external body. Skype/Lync is one of the suite of tools included in Microsoft Office 365 through Glow. 3. Navigate to the date and time on the calendar when you want to have a video-conferencing session take place – double-click on the space in the calendar for that date and time. 5. Next to the title “Attendees” type in the Glow usernames of those with whom you will be video-conferencing (select the user from the prompt which then appears. 7. 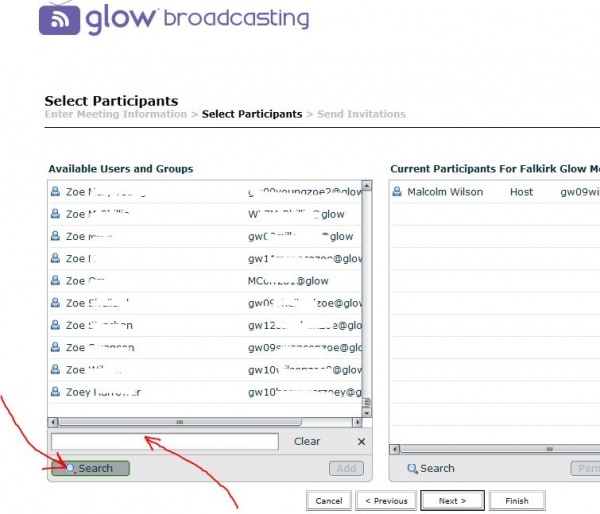 Now click “SEND” at the top left of the screen – that sends an email to the participants whose Glow usernames you have entered into the Attendees box. 12. Click on the video camera icon to broadcast video (or leave off if you are simply watching a presenter). 13. Click on the microphone icon to control whether audio is broadcast or muted. There is also a mobile device app available for users of Skype/Lync which can be used on smartphones or tablets. Adobe Connect is one of the suite of tools included to Glow users, referred to as Glow Meet within Glow. 1. You will require to have a Glow username and password to access this tool. Log into Glow at https://glow.rmunify.com. Scroll through the tiles on RM Unify until you find the tile called Glow Meet (for Hosts). Click on the tile called Glow meet (for Hosts). Note that you may see prompts to update software on your PC if updates or add-ins are required – accept these prompts. 2. You will require to have been granted host rights to be able to create a new meeting. 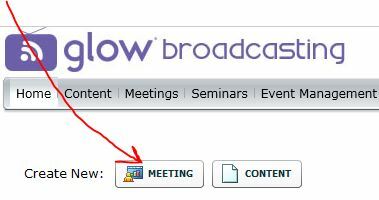 Click here for details of how to request this if, having clicked on the Glow meet for Hosts tile, you do not see “Create New Meeting” button at the top left of the Glow broadcasting window which opens. Click on “Create New Meeting” button if you are setting up a meeting. If you are accessing a previously set up meeting then you click on the “open” button beside the name of the meeting previously created). 3. Enter a name for the video-conferencing session beside the title “Name*” e.g. Falkirk PS Glow Meet. Enter a short version of this in the box marked “Custom URL” – this will be the web link you share with others. This will require to be unique so be aware the system may prompt you with an alternative URL. Leave all other settings as they appear without adding or making changes. Click the “Next>” button at the foot of the page. 4. This will display the “Select Participants” screen. At the bottom left click on the “Search” button. In the search box which will then appear above the Search button enter the Glow username of others to whom you wish to assign access to this meeting. Since you can also grant access during a meeting to people who have the link this can be left to be only for those with whom you may share administration of the video-conferencing session, or presenter during the session. You can find usernames of others by going back to the RM Unify tiles webpage and finding them by searching on via the RM People Directory tile. When the sought username appears on the “Select Participants” page then click on the “Add” button at the foot of the page. Your new user will now appear on the right-hand panel “Current Participants” for the meeting you are creating. You can assign the appropriate role level of permissions to each user by clicking on the username on the right-hand panel, then clicking on the “Permissions” button. Once complete then click the “Next” button. 5. 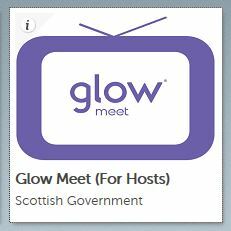 On the “Meeting Information” page which then appears, highlight the URL which is displayed (such as the example https://meet.glowscotland.org.uk/falkglowmeet/), right-click and copy your meeting URL. 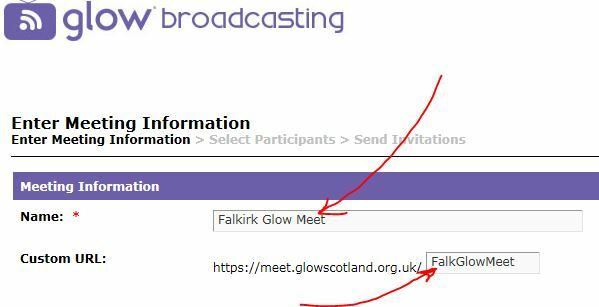 This will mean you will require to share the link to the Glow Meet with other users by sending it via email or adding it to a page others will be able to access. 1. Click on the link to the Glow Meet which you previously created (or which you shared by email with others, or shared on an online space elsewhere which others can access). First time you may need to allow any plugin as required or updates to software. 2. If you are the host of the meeting you will be able to accept the prompts which will pop up as guests to the meeting request access. You can assign different roles to participants by clicking on their name and choosing to enable their webcam, or microphone, or to increase their rights to be presenter (or joint host). You can change these rights again in the same way. 4. To be heard by others you will need to ensure you have clicked on the microphone icon along the top of the screen (you can mute it by clicking on the same icon – this will then show a diagonal line across the microphone icon. Note that other users will not automatically have this option unless you have enabled their microphone, or they are presenter or host. 5. To check audio settings (always worthwhile doing this in advance of a meeting) then click on “Meeting” on the top-left menu and then “Audio Setup wizard” and follow through the steps. 6. Click on the video camera icon to broadcast video (or leave off if you are simply watching a presenter). 7. Click on the microphone icon to control whether audio is broadcast or muted. Note that participants will not automatically have the option to switch on their microphone. All participants will be able to send text messages using the “Chat” window. 2. This will display a message to all participants that the meeting is being recorded, and a red circle at the top-right of the screen, until the recording is stopped. 1. Go to the Glow Meet (for Hosts) tile on the RM Unify tiled screen. 2. Click on “Meetings along the top of the screen. Note that only hosts will be able to view this. 5. Click on the link to the recording of your meeting. The page which is then displayed will show a “URL for Viewing” – this will be the link you should copy and share with others, wither by email or by adding to an online space accessible by others to whom you wish to share the link. 1. Don’t try to share video which is hosted elsewhere by sharing your desktop – instead share the link to that video in the chat box so that others can watch it straight from the link. 2. Try out your PC setup before a proper arranged video-conference session by ensuring your webcam has been plugged into the PC beforehand, that it is recognised as the webcam and the microphone. Check your speakers all work – going through the “Meeting” – “Audio Setup wizard” is essential for all taking part, in advance of the pre-arranged meeting. Adobe Connect is more than just conferencing by video – you can share uploaded files (such as a Powerpoint presentation, which a presenter can then guide viewers through); there’s a chat facility to get text message feedback throughout a presentation (and that includes the facility for messaging between individuals or to the whole group); there’s a polling tool to seek responses on specific questions (and this can include multiple choice, many choice responses and free text responses); there’s a facility for quick yes/no responses; and hosts of meetings can vary rights of participants as they enter the room or at any time in the meeting so that microphone and/or webcam can be enabled; there’s a “raise hand” tool to give the opportunity for participants to attract the attention of a presenter (it presents a pop-up box to the presenter); there’s a whiteboard tool to draw or share ideas in visual form; and there’s the option to share the desktop of a presenter to demonstrate something such as how a piece of software on the host PC works. There’s mobile device apps available to provide the facility for participants using mobile devices to access Adobe Connect meetings – this may open automatically when clicking on the shared meeting room web address (URL) or simply by copying that web address and pasting in the URL box within the app. How can I make a video link more engaging for learners? Many teachers around the world have shared about creative ways they have used video-conferencing tools. Some will use Skype while other will use another tool. The ideas are generally always transferable to any video-link tool – the learning activity is central to the use of the tool. So, whichever tool you use, the following may provide inspiration for how you could use a video link with your class. Skype in the Classroom – Microsoft has produced a superb site for supporting teachers looking to user their Skype tool in an educational setting. It provides training in how to make it work, ideas for how others have used it at different ages and stages, as well as across the curriculum, provides a forum for teachers sharing ideas or finding connections for their class project, and has topical links to fit in with events happening in current affairs. Microsoft also have a page of tutorials on using Skype/Lync. Mystery Skype is described as “an educational game, invented by teachers, played by two classrooms on Skype. The aim of the game is to build cultural awareness, critical thinking skills, and geography skills by guessing the location of the other classroom through a series of yes/no questions. It is suitable for all age groups and can be adapted for any subject area.” The post by Jonathan Wylie “Mystery Skype – a curriculum for schools” describes how it works and provides links to a host of resources to support teachers making use of Skype whethevr the age, stage or curricular area. Mystery Skype Excites Fifth Graders is a newspaper article describing the use of Mystery Skype by teacher Brad Luce. Five Ways to use Skype in your Classroom - an article by Kathy Cassidy which describes five ways to use Skype, specifically looking at how it supports literacy, mathematics, mapping, as well as bringing in expertise across the curriculum – and just for a bit of fun! 6 Creative Ways to Use Skype in the Classroom – a post by Kristen Hicks on the Edudemic site which describes different ways in which video links can support learners in a variety of contexts. The post also includes links to additional resources which would be helpful when making use of Skype. This entry was posted in Professional and tagged 1+2 Language Learning, Adobe Connect, audio, Global Citizenship, Glow, ICT, literacy, Lync, Microsoft Office 365 for Education, Mobile Technology, Office 365, Skype, Teaching Tools, Technologies, Video, video-conferencing on 11 November, 2015 by Malcolm Wilson. OneNote is a free tool which works online through a web browser, or through apps for mobile devices, or as a desktop software (it’s also part of Microsoft Office 2013). And it’s available to users of Microsoft Office 365 (so all Scottish school pupils and staff with Glow access have this as part of the features available automatically to them via their Glow login). It’s like a ring-binder where you can choose to have multiple sections (like card-dividers in a real ring-binder), and within each section you can have multiple pages​. And it all synchronises on multiple devices should you wish it to do so. How might OneNote be used in a classroom context? So you may be a teacher who may have sections in a OneNote file for each subject, and within each subject pages for each pupil. Each page can contain text, photographs, comments, web links, audio or video so may be an evidence gathering tool for a teacher. A picture to show evidence of a piece of practical work can be instantly inserted via mobile device straight to a pupil’s page for a particular subject in the OneNote file. Pupils could create a OneNote of their own and use it as a learning log, an eportfolio, a place to jot down their notes, links to resources, documents, websites, etc. And a OneNote stored online can be shared with another user – so a pupil may create a piece of work in a OneNote file for a particular topic, subject or teacher and share access to that so it could be shared only with that one pupil and their teacher. The creator of the OneNote file can choose to make it so that the teacher can add comments to the document for feedback to the pupil, directly on the document. And in some versions they can also add an audio file of feedback straight into the page. Choose Your Own Adventure stories - this links to a blog post by Pip Cleaves describing how using the facility to add links to different pages in a OneNote file pupils can create stories with alternative texts for different junctures in a story for their readers. So how do you get started using OneNote? If schools are signed up to Office 365 then they also have the additional option to use OneNote’s education-specific class tool OneNote Class Notebook Creator where a OneNote class file can be set up so that individual sections or pages can have different access rights or permissions. So a teacher may have a pupil’s page in a class OneNote file shared with only that pupil and the teacher, meaning that nobody else can see that pupil’s work except the teacher and the specific pupil. Or a group of named pupils could have access to specific pages for collaborative working. This is designed to make management easier for the teacher and give more options for different purposes. Note that in Office 365 the OneNote Class Notebook Creator needs to first be enabled by whoever administer’s the school’s establishment site – once it’s installed teachers can then set up their own class Notebooks. Here's a related interactive online guide to setting up and using OneNote Class notebook creator - listen to the information, move on pages at your own speed. OneNote and Assessment – this is a blogpost by Chantelle Davies describing how they see the use of OneNote for assessment with a focus on the audio and video features providing the facility for teachers to create a workspace for every pupil, to offer a content library for adding material, and a collaboration space, with which pupils can work in their space and teachers can give feedback in the same place. The work and feedback can be accessed anywhere any time. OneNote for Teachers - a comprehensive site which details how OneNote can be got for any device, how it can be set up for use, examples of ways in which it can be used, help guides and much more – all within a classroom context. This entry was posted in Professional and tagged 1:1, Assessment, Bring Your Own Device (BYOD), ePortfolio, Glow, handheld learning, ICT, Microsoft Office, Microsoft Office 365 for Education, Mobile Technology, Office 365, onenote, Teaching Tools, Technologies on 19 December, 2014 by Malcolm Wilson. Here’s a video by Tamara Sullivan explaining how learners in Sydney and Brisbane, who did not meet face to face, collaborated on a photo essay project using OneNote as the vehicle by which they could share ideas, tasks, photo-essays and comments by learners on the work of others. Note that in Office 365 the OneNote Class Notebook Creator needs to first be enabled by whoever administers the school’s establishment site – once it’s installed teachers can then set up their own class Notebooks. OneNote for Teachers – a comprehensive site which details how OneNote can be got for any device, how it can be set up for use, examples of ways in which it can be used, help guides and much more – all within a classroom context.